Addiction pervades all aspects of life, creating biological, psychological, and also spiritual problems. Addiction is also imperfectly understood, and treatments that work well for one, offer little to another. Ideally, drug and alcohol treatment programs combine a number of treatment modalities, in an attempt to offer each addict or alcoholic effective tools against relapse, but also as a way to treat the problems of the body, mind and soul in a holistic, and comprehensive way. Of the body, mind and soul, the last – spirituality, is the hardest to define and study; it's just not quantifiable. It is difficult to prove with science why or how spiritual therapies help, but they do, and they are important. Most Native American traditions use some form of sweat lodge ceremony as a ritual of purification, spiritual cleansing, and rebirth. While not a religious rite, the experience is spiritual, and those that have participated in a sweat lodge ceremony will intone of the power and intensity of the experience. The sweat lodge is a cavern like structure, circular and small, designed to keep heat and perfect blackness – designed to represent the womb and Mother Earth. Entrants to the sweat lodge crawl through a narrow opening into the darkness, an opening that represents the birth canal. After purification rituals, the fire-keeper will bring in super-heated rocks. The doorway is closed, and water poured on the rocks creates intense steam and heat. Sitting in the complete dark, all will participate in four rounds of prayer. You may pray to any deity or spirit, but all prayers must be for others, wishing goodness to those beyond yourself. Each person will take a turn praying, either silently or aloud, and when each circle of prayers is complete, the door is opened, and there is a break and a breath of cool air before the cycle starts anew. A sweat may take as long as 4 hours, depending on the number of participants. When finished, all participants will crawl through the entry/exit tunnel into the world and away from the womb of the sweat lodge. The exit symbolizes a spiritual rebirth, a leaving of the past behind and a future of new possibilities. Most participants of a sweat describe the experience as powerful. The heat can be extreme, far greater than in a conventional sauna, and the sweat can take hours. 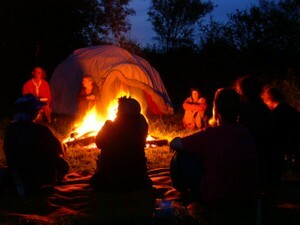 Most people describe feeling a close bond with other participants sitting in the darkness, and many describe a sense of euphoria after having completed the long sweat. The heat is extreme and can be very uncomfortable; some people may need to leave prior to the natural conclusion. The lodge, as a physical metaphor for Mother Earth seems to connect the spirit to the ground, creating harmony and connection between the self and the world. Therapeutically, in the field of addiction treatment, the sweat lodge is used to help recovering addicts and alcoholics find peace with themselves, with their pasts and with their God, however they understand that God. Addiction recovery and a future free from relapse demands self knowledge and spiritual peace. With these two strengths, addicts and alcoholics are strengthened against temptation. The sweat lodge has been used for ages in hundreds of aboriginal traditions for its healing properties and spiritual cleansing. It is powerful and it can help.